On 25th June the 2015 Australians will begin their tour at Canterbury. The traditional opener at Arundel has long been dispensed with, sadly, but Kent will be one of the few counties to entertain the tourists. Time was, of course, when the tourists would play every county – a few of them twice – as well as the Universities, MCC, and maybe Scotland, Ireland and the Minor Counties as well, the programme continuing for several games after the last Test. Those days are long gone and will never return, but for those of us without deep pockets the tour match provides an opportunity to see the opposition in the flesh without shelling out for tickets for international fixtures. 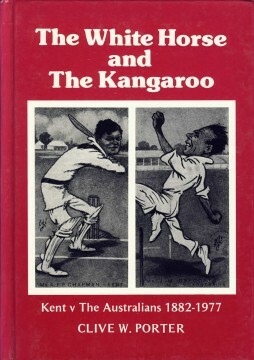 This slim but diverting book tells of the 28 matches played between Kent and the Australians between 1882 and 1977. In two years, 1890 and 1893, two matches were played: in addition to the fixture at the St Lawrence ground the tourists were also entertained at Gravesend – a long-gone ground – and Maidstone, where Mote Park is still used for second eleven games. The scores are summarised in an excellent statistical section at the back, and a glance at the totals suggests an improvement in batting conditions – in 1888 the visitors with 116 and 152 comfortably overcame the county who replied with 107 and 80, but Warwick Armstrong’s men in 1921 knocked up the little matter of 676, and passed 400 regularly after that. Bradman, unsurprisingly, made his mark – in 1930 he made amends for a cheap first-innings dismissal with 205 not out, while in 1938 and 1948 he made do with 67 and 65 (he played, but didn’t bat, in 1934). Besides the Don, many of the great players from both sides distinguished themselves in the fixture: Jack Gregory took 7-100 for the Australian Forces XI of 1919; Armstrong made two hundreds twelve years apart, while Bill Lawry and Norm O’Neill each made one in both 1961 and 1964; Victor Ransford in 1909 hit 189, the highest score for the tourists after Bradman’s double; Bill Johnston took 11 for 73 in 1953, and Charles Turner five or six wickets on no fewer than four occasions. For the county Les Ames hit a second-innings 139 in 1938 which failed to prevent a 10-wicket defeat, and Peter Richardson twin centuries in 1964. Tich Freeman, Doug Wright and Alec Hearne took plenty of wickets. But perhaps the most successful of the home batsmen was Colin Cowdrey, whose three hundreds included an unforgettable unbeaten 151 which took the county to a memorable win against the 1975 visitors, Lillee included. This game apart, perhaps the best contest came in 1893 when the county won after following on; needing just 97, the Australians succumbed for 60. With full scorecards of each contest, match reports of a thousand words or so, a number of illustrations and pocket biographies of the leading performers, as well as the aforementioned appendix, this little book is well worth tracking down at a reasonable price.